Ah, I get good ol’ nostalgia vibes from this for two reasons. 1 of course is this is from Street Fighter II. 2 is that this was out theme song for The Wired Fish Podcast Season 1. It just has that energy, that POW right from the beginning. Street Fighter II had three songs to represent America. Guile’s was proud America. Balrog’s was swanky Amercia. But Ken’s theme here was cocky America, the one with the Hollywood action movies and witty one-liners. This was of course back then. So, do you Hadoken or do you Shoryuken? Is it me or is Yoko Shimomura like the TOSE of videogame composers. Like, if you’re not sure who was the composer of a videogame, it was probably Shimomura. Anyway, here is song from my favorite game of all time for over 10 years straight, Super Mario RPG: Legend of the Seven Stars. Something about this song reminds me of ol’ busybody New York City, like how you see it in one of those old sitcoms like Taxi or The Odd Couple (Not sure about that second one, but somewhere around there). So to all the New Yorkers out there, which borough you represent? Oh how I wish I played Legend of Mana. The only game I played in the Mana Series is Secret of Mana on the Wii Virtual Console. So then, here’s Earth Painting from the game. You can start to hear one of the staples of modern Shimomura music: the marching drum beats. You can really star to hear her music mature beyond what she did for the 16-bit days. Early in a composer’s career, you can hear the most variety in their repertoire. But in due time, there’s one element that identifies a composer, and sometimes you can identify a composer without previously playing a game. Kinda like how James and I can identify companies based on soundsets. Since this was first released in a Summer, What other game(s) do you remember playing during the Summer back then? Remember those marching drum beats I mentioned yesterday? Well, this is where that style came to the forefront. Ever since Kingdom Hearts, Shimomura’s music became identifiable. Many people, including myself, hear her music and might say, “this sounds a lot like Kingdom Hearts.” You’ll see what I mean when I post tomorrow’s selection. The consistent drum pattern and back melody doesn’t stop. From beginning to loop, there is a sense of dread and urgency, like there’s not time to think and assess the situation. Playing Kingdom Hearts back in 2002, this song made me realize that this wasn’t your typical Disney. This was Disney done by Square (similar to how Mario was done by Square). I welcomed this change. 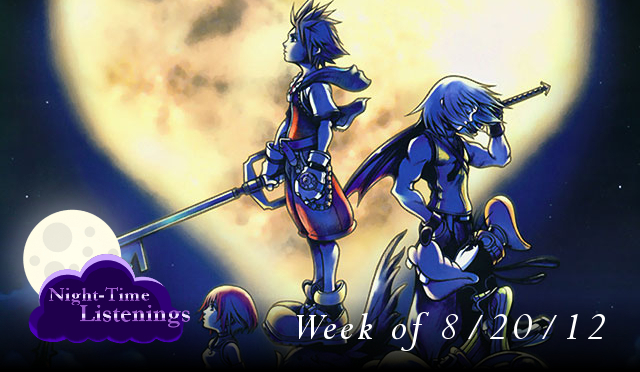 So, what got you into Kingdom Hearts back in 2002? Xenoblade Chronicles – Time To Fight! Look at the comments section in that video. You’ll see, like I said yesterday, that many people know who composed this just by listening to those drum beats. In other words, “It sounds like Kingdom Hearts.” But this isn’t Traverse Town or Hallow Bastion. This is the Bionis, and some wildlife is going down! One thing here that seems to be the theme of the Xenoblade Chronicles soundtrack is long sustained violin notes. Even in the battle theme you hear it carry out the melody. Without spoiling too much, one can hear this song as something of a foreshadowing to what will happen in the future, one that will make you reevaluate pretty much all the flora, fauna, and grand vistas of Bionis. So then, are you good at telling the future, or good at telling time?